Kyocera International has introduced a rugged Android smartphone the company designed to support public safety communications via a nationwide first responder network AT&T is building for the U.S. government. 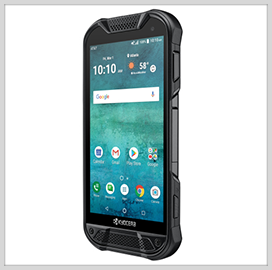 DuraForce PRO 2 is built to provide LTE connectivity even in harsh environments and operate on the FirstNet wireless broadband infrastructure, Kyocera said Friday. The military-grade device, which supports the FirstNet Band 14 spectrum, is equipped with dual front speakers, four-gigabyte random access memory and front, rear and action cameras. Kyocera developed the phone to comply with Military Standard 810G and Federal Information Processing Standards. AT&T offers DuraForce PRO 2 to FirstNet subscribers and other customers through the telecommunications firm's Next plan.